Sgt. Robert C. Banks, son of Mr. and Mrs. C. Banks, graduated from Manitou High School; husband of the former Mildred Jones. 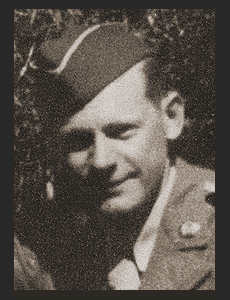 Entered the Army in Feb. 1942, trained in Camp Swift, Texas, Camp Polk, La; went overseas in Dec.,1942; served in England, France, Belgium, Holland, Germany; Awarded ETO Ribbon with five Battle Stars, Good Conduct Medal.